Wool buffs, compounding buffs, polishing buffs, compounding pads, polishing pads, buffing pads, mini buffs. For larger wool buffs, see the Buffs for 7½" pads page. Backing pads are shown on our Backing pads for wool buffs page. 4 1/2" outside diameter, 3" diameter backing pad surface, 1/2" pile height. Grip-on hook and loop backing. 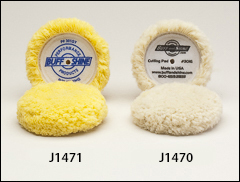 J1470 buff is 100% wool, 4 ply. J1471 buff is wool blend, 4 ply twist. 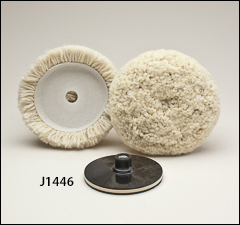 Spot buffing pads suitable for small buffing areas. Maximum RPM: is 3,000. Sold by the pack, 2/pack. 7 1/4" outside diameter, 5" diameter backing pad surface, 1 1/4" pile height. 100% 4 ply wool compounding buffs with either grip-on hook and loop backing, or a bolt-on backing structure. Also available with direct mount pad with 5/16"-24 threaded spindle. Backing pad is made with highest grade of J Hook fabric and strong metal 5/8"-11 internal threads. Maximum RPM: is 3,000.